Comes in nice leather case, with 3-digit number lock if needed for added security. 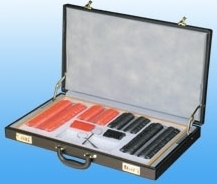 Wooden case within leather case can be taken out if required. Plastic rim lenses of standard size of 38mm with aperture of 22mm. Comes with an 0.25 cross-cylinder, manual & lens cloth. Accessory lenses: 4 prism lenses (0.5, 1, 2, 3), cross-hair (for measuring PDs exactly), pinhole, occluder, stenopeic slit, red filter. This trial lens set is of a high quality. In stock: Delivery within 3-5 working days.